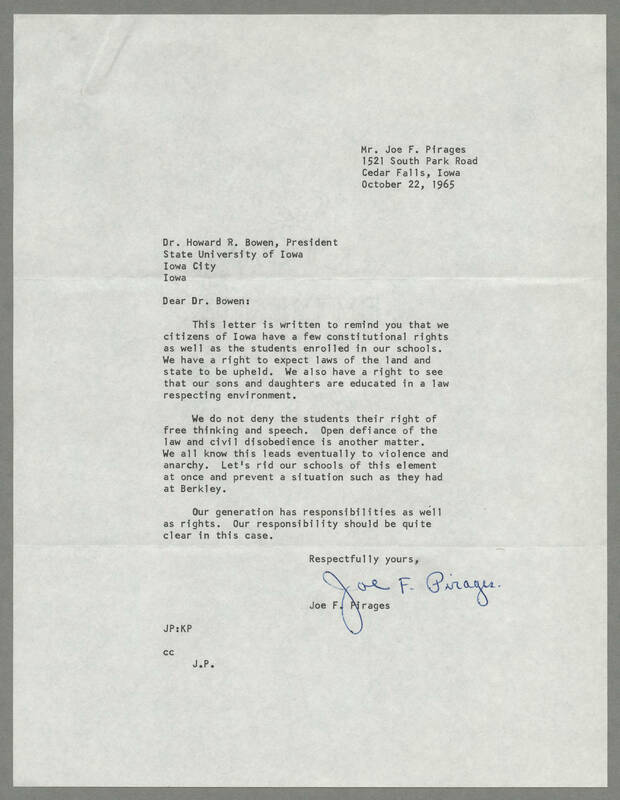 Mr. Joe F. Pirages 1521 South Park Road Cedar Falls, Iowa October 22, 1965 Dr. Howard R. Bowen, President State University of Iowa Iowa City Iowa Dear Dr. Bowen: This letter is written to remind you that we citizens of Iowa have a few constitutional rights as well as the students enrolled in our schools. We have a right to expect laws of the land and state to be upheld. We also have a right to see that our sons and daughters are educated in a law respecting environment. We do not deny the students their right of free thinking and speech. Open defiance of the law and civil disobedience is another matter. We all know this leads eventually to violence and anarchy. Let's rid our schools of this element at once and prevent a situation such as they had at Berkley. Our generation has responsibilities as well as rights. Our responsibility should be quite clear in this case. Respectfully yours, Joe F. Pirages Joe F. Pirages JP:KP cc J.P.